I learned a valuable lesson during last week's First Annual Tree and Plant Diagnostic Walkabout Workshop held in the beautiful Lake Hope State Park in Vinton County, OH. If you want to find caterpillars, you should hike with Tom Macy, Forest Health Program Administer, with the Ohio Department of Natural Resources, Division of Forestry. Tom's cater-optic prowess is truly remarkable. Thanks to Tom's almost preternatural ability to spot caterpillars, the workshop participants were able to view a wide range of fascinating caterpillars including several that can sting. As with many creatures in Nature (e.g. snakes, crocodilians, bears, etc. ); these caterpillars should not be handled. The vast majority of lepidopteron (moths and butterflies) caterpillars, even many with hairs, do not present a threat. However, there are some with hairs that are modified for defense. These are collectively called urticating hairs from the Latin urtica meaning "nettle." Indeed, the hairs on stinging nettle (Urtica dioica), which are called trichomes; provide a good model for the venom injecting mechanism used by some of the more serious urticating hairs found on caterpillars. In general, caterpillar urticating hairs may be divided into two groups: long, flexible hairs; or stout bristles. These two groups can be further divided into hairs that puncture the skin, with some types breaking off to cause mechanical injury or hairs that puncture the skin and inject venom (envenomating hairs). Tussock moth caterpillars (family Erebidae) can have both types of hairs; however, the effects may be enhanced by a person's overall sensitivity. Some people have a severe allergic response to hairs that simply penetrate and break-off. They may suffer extensive rashes and localized swelling causing them to believe they have encountered envenomating hairs when they have not. I've handled and sometimes miss-handled several types of tussock moth caterpillars over the years while taking photographs without ever suffering any reaction. That was before I became aware of the threat. Either I was lucky (not likely), or I'm not sensitive; a perspective that's oddly supported by my wife. Either way, I no longer handle tussocks or any other hairy caterpillar without knowing the risks; ignorance may not be bliss. Diagnostic Workshop participants were able to view (at respectable distance!) infamous stinging caterpillars that belong to the families Megalopygidae (flannel moths) and Limacodidae (slug caterpillar moths). A real "show stopper" was the Hag Moth (a.k.a. Monkey Slug) (Phobetron pithecium) caterpillar which looks like a piece of leaf debris; albeit a very dangerous piece of debris! The group also observed a White Flannel Moth (Norape ovina) caterpillar as well as an early instar Black-waved Flannel Moth (Lagoa crispata) caterpillar which we dubbed "the living Q-Tip." Thanks to Tom's incredible "cat-vision," we all got a close-up (well, not too close!) look at an Io Moth (Automeris io) caterpillar which is covered in venomous spines. The moth belongs to the Giant Silkworm family, Saturniidae. While many giant silkworm caterpillars are adorned with spiky barbs, few species actually have envenomating hairs. For example, Tom thrilled the group with finding a middle instar Hickory Horned Devil (a.k.a. Regal Moth caterpillar) (Citheronia regalis). Even the smaller-sized version of this impressive caterpillar looks threatening with its horns and barbs; however, it's all are ruse since none are designed for puncturing our skin. mentioning because they pack serious stings. 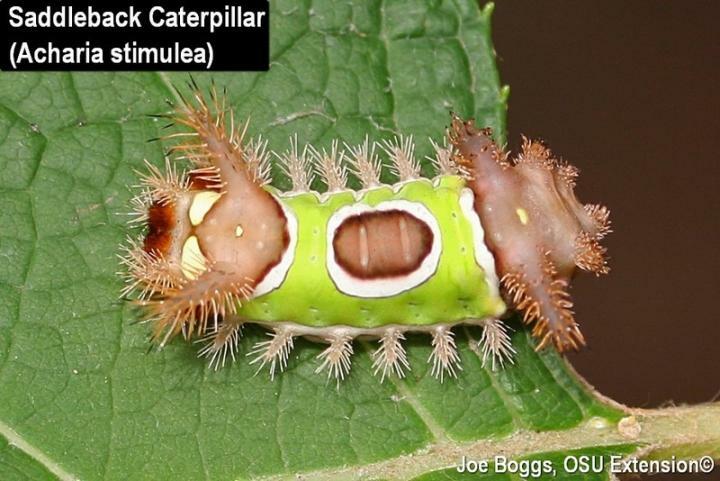 These include the Saddleback Caterpillar (Acharia stimulea), Crowned Slug (Isa textula), and Skiff Moth (Prolimacodes badia) caterpillar. Saddlebacks are capable of launching a two-pronged defense response. All of its stout urticating bristles may break-off to remain embedded in their assailant. Some are envenomating bristles and they contain two types of venoms: vesicating (blistering) and hemolytic which breaks down red blood cells. Stings from these hairs are intensely painful and are described by hapless victims as sharp and burning. The pain may last for a long time and often spreads over a large area. Although saddleback stings are not generally life-threatening, it is best to seek medical attention. As with bee and wasp stings, some people are particularly sensitive to the saddleback venom. Not all hairy caterpillars are hazardous. However, unless the caterpillar is identified as innocuous, don't handle them; it's best to err on the side of caution.